It’s a quiet and snowy Saturday night in Toronto, but inside a downtown recording studio five aspiring musicians are getting an opportunity to create music with one of Canada’s rising stars — singer Jessie Reyez. At a time when music programs in Canada are dealing with budget cuts and inadequate funding, Reyez is one of a number of Canadian artists taking it upon themselves to create spaces to nurture the next generation of emerging talent. “I’ve been wanting to do this for a long time,” said Reyez, who just wrapped up a sold-out 30-city tour. Since being awarded the Juno for breakthrough artist in 2018, the Colombian-Canadian singer’s voice can be heard on tracks with Eminem and DJ Calvin Harris. She’s up for two Juno Awards this year, including a nomination for her songwriting skills on chart-topping hits like Dua Lipa’s One Kiss and Sam Smith’s Promises. Reyez said given her success in the last year, she wanted to pay it forward. In a call-out on Instagram in January, the singer asked artists to share their work for a chance to attend a songwriting workshop. All they had to do was tag their performance videos using the hashtag #jessiereyezworkshop. One week later, more than 1,300 submissions were uploaded from young artists singing, playing instruments and rapping in their bedrooms. From these virtual auditions, Reyez said she chose artists whose voices resonated with her but also artists who showed their drive on their social media feeds through countless posts of them performing — something Reyez did when she was trying to get her big break. 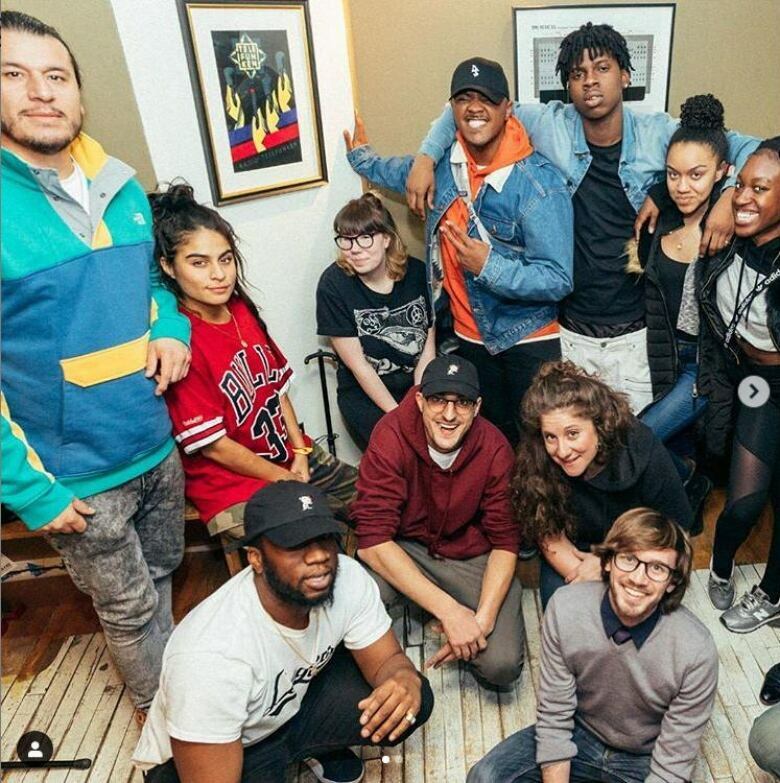 Reyez then called on industry friends, including hit-making Los Angeles producer Khris Riddick-Tynes and her tour guitarist, Heather Crawford, and locked in studio sessions at Toronto’s Dream House Studios for a two-day songwriting workshop. The young artists had the opportunity to hear from leaders in the music industry and were able to record an original demo song with a team of professional sound engineers. Aspiring rapper Ozron Walters — who performs as v.e.l.o.w — was one of those voices that stood out to Reyez. When he saw Reyez’s invitation on Instagram, he started tagging his verses and was surprised that the hitmaker took notice of him. “For Jessie — someone who’s just like up here, especially in my eyes — to kind of come and get somebody like me that’s just fresh off the block, it means a lot to me,” Walters said. The 18-year-old from Scarborough, Ont., said on the first day of the workshop they received valuable advice about navigating the industry but it was the one-on-one coaching in the recording booth that has been most empowering. “Jessie would walk in and out and she’d be like, ‘You need to continue. You gotta keep going,’ Walters said of Reyez encouraging him to not give up. By the end of the workshop, instead of one original track, Walters recorded four demos. Walters said he’s excited to share what he has learned with his family and community. By Day 2, the five young artists, who specialized in various genres of music, started to collaborate on their recordings. For soul-pop singer Renee Henry, the experience is fuelling her confidence. “Being in an environment where I’m forced to believe in myself and see the beauty in myself means everything to me,” said Henry. A former psychology student at the University of Toronto, Henry decided to step away from academics and pursue her passion for music. While she said it has been a challenge, the other important lesson she’s walking away with is that it’s OK to fail. For Reyez, the need to give back and create opportunities for young musicians was inspired by her experience at The Remix Project, a program for creative youths that she credits with helping support and develop her as an artist. The business arts program offers alternative education to young people from disadvantaged communities who are trying to pursue careers in creative industries. It’s where Reyez learned to record her own vocals, gained access to studios and found mentors. Access to music programs is a challenge for many communities. In Ontario, a 2018 study found access to the arts in its classrooms was directly related to factors like the location and size of schools and the education level of parents. And for well-funded programs, they are often reliant on fundraising or focus on forms of traditional or classical music, but not everyone takes a traditional path. It certainly wasn’t the path for artists like Grammy award-winning singer Abel Tesfaye, known as The Weeknd, who didn’t graduate from high school. The Weeknd and his creative team are the forces behind HXOUSE, a new startup in Toronto described as an incubator for up-and-coming artists and entrepreneurs who specialize in design and music. In an interview with CBC’s Dwight Drummond, co-founder La Mar Taylor said they wanted to create the kind of space they didn’t have access to when they were starting to create and promote their music. “Coming up, we had no access to mentorship, resources or even a space where creatives could come together,” Taylor told Drummond. They hope to expand HXOUSE to other cities. Montreal funk-duo Chromeo has been offering producing skills and studio time to new talent. “We’ve started working with other younger artists that we really believe in,” lead singer Dave Macklovitch said from New York. Chromeo has been making music for close to 15 years. With their fifth studio album Head over Heels earning them their first Grammy nomination and two Juno nominations this year, the group said it is in a position to extend a helping hand. It also has plans to start its own label and develop new and fresh voices. Macklovitch said they’re reluctant to use the term mentoring because they are also gaining something from the experience. Follow the 2019 Juno Awards live on CBC-TV, CBC Radio One, CBC Music, CBC Gem streaming service and online at cbcmusic.ca/junos at 8 p.m. ET on Sunday, March 17.